February 14th is around the corner, and if you’re in a relationship, then you know why this day is important: it’s Valentine’s Day! Have you ever wondered how this special occasion ended up on February 14th, and who created it in the first place? Dallas House of Flowers is here today with a little history lesson: read on to learn about the origin of Valentine’s Day! Legend says that Valentine’s Day originated in the 3rd Century in Rome. During his rule, Emperor Claudius II thought that in order to build a bigger, stronger army, he should use only single men. He thought that men who were married tended to be more easily distracted and weaker than their single counterparts. So, he created a law that forbid marriage for young men. Valentine’s sentiments are still used today between lovers, and on February 14th, they proclaim their love to each other for the world to see by declaring each other their Valentine. If you’re new to the Valentine’s Day traditions and you’re not sure how to express your love this February 14th, flowers are the ultimate Valentine’s Day gift. 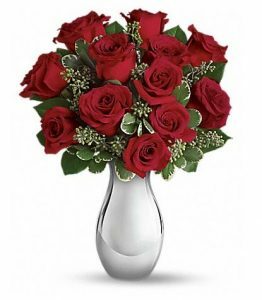 Click here to view some of our favorite Valentine’s Day arrangements here at Dallas House of Flowers, and place your order online or by calling 214-339-1612 today!